Next to mama's elaborate posts informed by years of experience and accompanied by beautiful photos, mine are beginning to look more amateur than I would like. But there is not much that I can do about the scarcity of time. I suppose, our recipes reflect our lifestyles. Mine are usually about quickly throwing something tasty together. Here's another one of these salads. 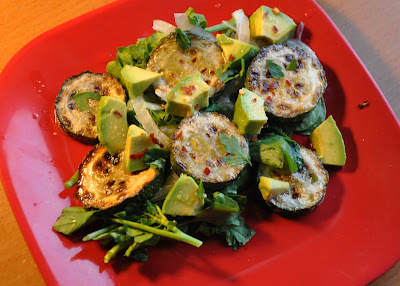 In this recipe, the watercress complements nicely the mildness of avocado and zucchini. This salad is creamy and delicious, gentle to the palate and satisfying. Given Gary's unexplained loathing of both zucchini and avocado, it is not surprising I have not discovered this combination earlier, as I tend to avoid both ingredients (unless carefully disguised). But, being sick and so alone at home, I had some freedom. Fry zucchini in 2.5 olive oil on medium heat until golden brown. In a plate, place roughly chopped watercress. Cover with thinly sliced and squeezed half-moons of onion, sprinkle with balsaminc vinegar. Arrange fried zucchini and avocado cubes on top. Drip lemon juice over this, primarily on the avocado to prevent it from darkening from contact with the air. Sprinkle with large-grained salt and some black or chili pepper. Enjoy!